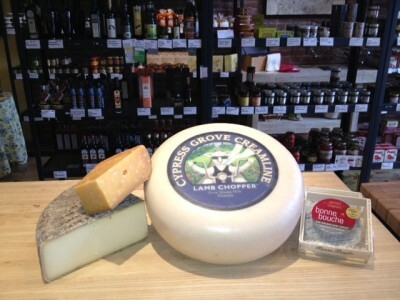 This lamb’s milk cheese is a fast-selling favorite for regulars. Don informed me that one of their Yelp reviews name checks this cheese specifically. It’s from a small dairy in Arcata, CA. It’s a firm cheese, one that reminded me of a milder, softer Dubliner cheese. Although he had a full wheel on hand, he says it sells out within a few days it’s so popular. A soft/runny goat’s milk cheese, the Bonne Bouche is light and tasty. It comes from the Vermont Butter & Cheese Creamery. An award-winning cheese, it’s aged 10 days in a vegetable ash rind that’s edible. This hard cheese was one of the highlights for me. It’s a salty, bitey, delicious piece of Dutch culture. Highly recommended. This French cow’s milk cheese has a more sophisticated flavor than I expected. It’s a semi-firm cheese with a strong flavor reminiscent of a goat cheese. Fromage & Specialties is located at 33 E. Main St. in Los Gatos and they’re open Tuesday- Sunday. Check out their website for more gourmet cheese selections. Thanks, Don!